We are working as motorcycle aftermarket parts manufacture since in 1976. We do test-run for final checks at any season 365 days under all conditions from highway and straight or corner. A long-distance test-run is the one of our necessary work, before we sell it. Since the test amounts is about 1000 km(625mile) in one day. therefore, after purchase you may be feel that is a little hard. However, “break in seat” is required for the seat of K&H. 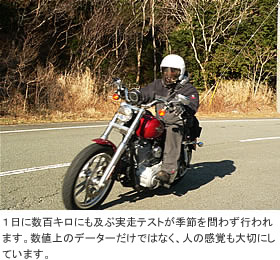 riding under any condition with weight shift repeatedly to adapts itself to your body. after about 3000km(1865mile) of riding the seat will be best seat for you. A seat is inspected by the staff from various angles after completion. Before shipping to a customer it checks thoroughly, and the check mark of the staff who checked at the end. And “K&H” and the stamped nameplate are decorated by all the seat so that anyone’s eye may notice that it is a product made from K&H, when a seat is seen from back. We send to a customer with confidence so that there may be no shame in the nameplate of K&H. we hope customer could think that it is pleasant because put and manufacture an true heart and you use the part of k&H. 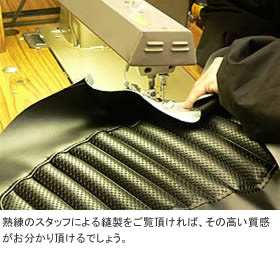 We continue to make various efforts so that customers may using our products again in future.